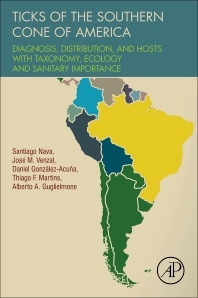 Ticks of the Southern Cone of America: Diagnosis, Distribution and Hosts with Taxonomy, Ecology and Sanitary Importance focuses on the tick species prevalent in The Southern Cone of America, including their distribution, biology, associated pathogens, their effects on the host, and control methods. Based on review of the literature from more than five decades, 62 species of both hard and soft tick have been discovered on the Southern Cone of America. Tick genera observed and recorded include Amblyomma, Dermacentor, Haemaphysalis, Ixodes, and Rhipicephalus. Dr Nava is a young Argentinean researcher whose interest is focused on systematics, ecology and control of ticks, and epidemiology of tick-borne pathogens. Within this subject area he coordinates different projects on ticks with medical and veterinary importance. The principal contribution of Dr. Nava has been in the study of Neotropical ticks, and he also has an active collaboration with scientists from more than 20 countries from America, Europe and Africa. José M. VENZAL is a young Uruguayan researcher on ticks and tick-borne diseases with a great expertise in systematic and phylogeny of Argasidae, a field mastered for few persons worldwide. The contribution of Prof. Venzal has been fundamental to describe several new Neotropical species of ticks (argasids and ixodids) but also for tick ecology and epidemiology of ticks-transmitted diseases. He received the Scopus Award Uruguay 2011 in the area of Agricultural Sciences. Editorial Elsevier and the National Academy of Veterinary Medicine of Uruguay Award 2008. Daniel González Acuña is a doctor in Veterinary Medicine at the Institute of Wildlife of the Veterinary Medicine Superior School of Hannover, Germany. Full Professor of the Faculty of Veterinary at the Universidad de Concepción, where he teaches General Zoology for students of Veterinary Medicine and Agriculture Zoology for students of Agronomy. Prof. González-Acuña is specialized in parasites of Chile´s wild fauna; within this endevour he coordinated several research projects about ticks from the wild fauna in Chile. His contribution resulted in the description of several new species of ticks found in Chile and neighbor countries, and relevant biogeography information. 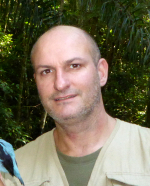 Dr. Martins is a Brazilian posdoc student with a prolific contribution on tick taxonomy and ecology. Dr. Martins made a very important contribution for the diagnoses of Argentinian and Brazilian nymphs from the genus Amblyomma, the most numerically important tick genus in South America. He is an active collaborator with many tick-research groups in Brazil and elsewhere providing his expertise for tick identification. Dr. Guglielmone is a senior Argentinean scientist with a long career on ticks and cattle tick-borne diseases started in 1975 but currently dealing with biogeography of Ixodidae. Dr. Guglielmone contributed with more than 300 scientific articles and several books, and collaborated with scientists from more than 30 countries. He also received several awards and is a member of the Academia Nacional de Agronomía y Veterinaria (Argentina).